Thomsen....The only name you need to know in ice edgers. From the industry standard T-18 with a reliable 10.5 hp OHV low emission Briggs & Stratton engine, to the innovation of the emission-free cordless electric T-29 ice edger. Precision leveling of the ice designed to cut a 18" wide path and a contoured snow chute that directs snow and ice onto the rink floor and keeps snow and ice away from the operator. Our easy height adjustment system is located within easy reach of the operator and our quick-change ice cutting carbide blades simplify everyday operations. In the 1960’s we introduced the first ice edger, our tradition of innovation continues today with the introduction of safety improvements to the industry standard Thomsen Ice Edger line-up. 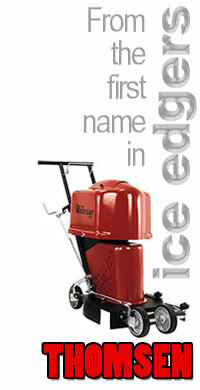 For the quality ice sheet you want, Trust the First Name in Ice Edgers™. From the industry standard T-18 gasoline powered edger, the clean burning Pro-18ES propane powered ice edger (only available outside of the USA) , and the emission-free T-29 “cordless” electric model. Call your arena supplier for Thomsen ice edgers and parts, including Model 90 series parts. We feel that this is the best machine on the market and there is not an edger on the market with more power. Thomsen invented the first ice edger in the 1960's and has been improving them ever since.